'Boring' Singapore City Photo: Follow That Fire Engine! Last Saturday, Momo noticed a fire engine behind our car on the road. She asked me look at the fire engine behind us! It looked different! The reason we wanted to take photos of the fire engine was because we noticed the license plate is not the usual Singapore license plate. 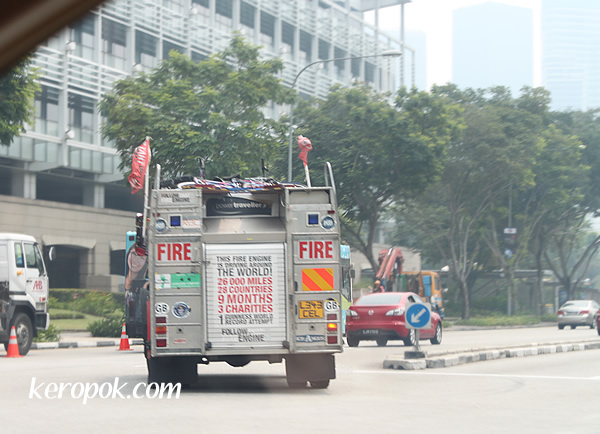 Also, it was not the usual civil defence fire engines we see in Singapore! We saw the license plate and noticed the stickers all over the truck and guessed it must could from the UK! Oh yes it was! This fire engine had traveled all the way from UK! 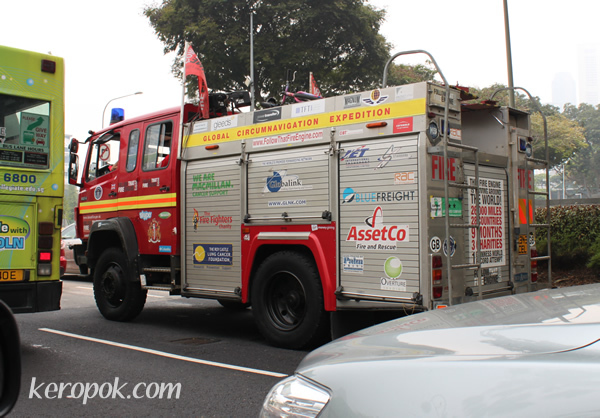 What was the UK fire engine doing in Singapore? This grand dame can move really fast! So sorry for the a bit blur of the next photo. Labels: Fire Engine, Seen on the streets.